The countdown to London Fashion Week has well and truly began! I can't believe its come round this quick this season and Im in all of a tizz at the moment about it. They seem to have changed the blogger BFC accreditation policy so who knows if Im going to get a fashion week accreditation or not. Not that it really matters because on the upside I do have tons of backstage stuff as well as lots of show tickets! I think this is actually going to officially be my busiest season ever so expect tons of stuff on the blog from the shows to my outfits and street style. I love and hate fashion week as I say every season. It's intense, overwhelming and so much work but it's so exciting and engaging and really really inspiring. As someone who doesn't have the budget to afford items from from designers, I do love seeing how I can take trends and make them work for a high street budget. That's the perfect colour pop! I kinda wish I could go to Fashion Week but at the same time it sounds waaaaay too stressful for me! I love the necklace and the neon trim looks lovely! Love your style as usual ! How long did your pink hair last ? I'm thinking of trying it ! Love that jacket! So nice to see you do outfit posts out and about Lily - you look fab! Love that pop of orange neon! The sandals are so cute! 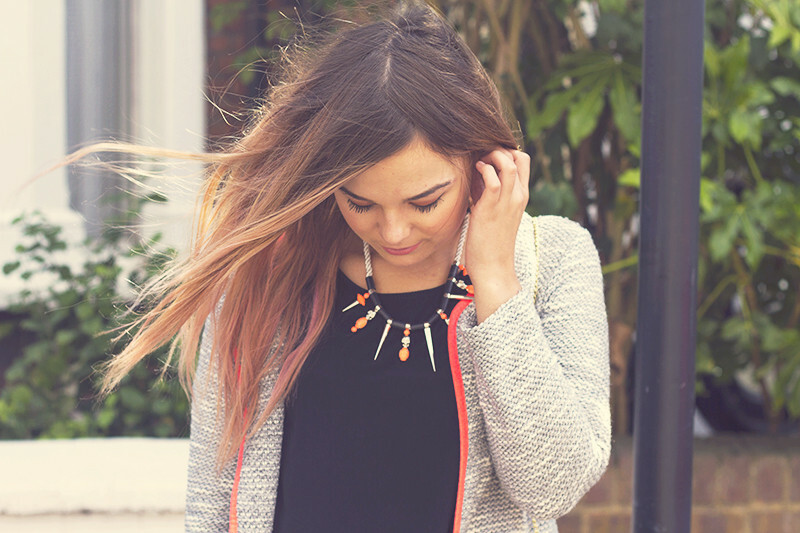 I adore the pop of neon Lily - it ties in so well with your necklace! This jacket looks great on you! Love the jacket. Have fun at fashion week! Love this outfit, especially the necklace! I seriously pretty much always like your outfits. So I like this one again as well! I love the discopants look. Love the jacket and necklace! Been umming and ahhing about this jacket for ages and you've just convinced me to go for it :) oh and your hair looks gorgeous! I really want those american apparel disco pants! Love the jacket and necklace. Great look dear, i love your necklace! Great casual style! Love the necklace! gorgeous jacket! you're always so well put-together! hi lily. can you please tell me the size of your jacket? im about the the same size as you are, but im always confused when it comes to ordering online.